me: (lookin through cute liddol doggie pictures of my friend's site) "Awwww makes me wish I had a doggie"
Issa: "Aww me have no doggie. And you do have one. I mean, TWO." me: "No, I mean I want a CUTE one." 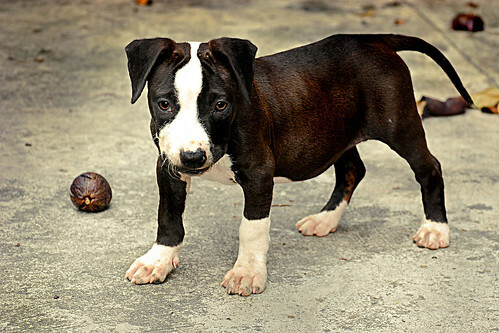 Whatever happened to my 2 Pit Bull Terriers, Arf and Woof? They're TOO BIG for me to handle now. All they ever do is run around, eat, jump on you when they see you and ruin the plants in our compound. I never get to play with them anymore. I'm never at home. But yeah, I come home and never fail to notice them cos.... they're staaaanky. LOL. I've always wanted a cute little dog to take around in places like Serendra or Rockwell. Saw a cute teacup Pomeranian puppy once at Tiendesitas worth Php 22,000 and I'll never forget about that adorable thing. I reallyy want to get one in the future. That or the sugar glider. Or an iguana- Soooo emo. TOMORROW, y'all should stop by this private sale. Won't be able to since we have a shoot in the south. Please check out my friend Isabelle Dee's booth for Bloomintails (they're just startin out). SPREAD THE WORD! And oh, I wasn't able to buy my lens today. Our shoot with Martin ended late, went home and dad said the stores at Hidalgo would be closing already. Tomorrow will be a loooong day for me. Gotta be up early to go to Quiapo and then I'm headed to the shoot(s). This should be interesting. I will always love black.